ST. PETERSBURGDespite the fact that the Murmansk Regional Land Committee declared that initial oil drilling plans by one of the region’s oil companies has supplied insufficient documentated to begin its project, it is also defacto punishing reindeer breederswhose land has been abused by the oilmenfor bringing the environmental abuses to light. The case raises obvious questions of fairness regarding the reindeer breeders, who had little knowledge of the oil companys activities. The Murmansk Regional Prosecutor filed a complaint in the regional arbitration court demanding that it declare invalid a land rental agreement between the Rangifer reindeer breeding farm and the Pechenga district regional administration. Earlier, it was the very same Rangifer that had complained of illegal oil activities on land owned by the reindeer breeding farm on the Rybachy peninsula. In late 2003, oil speculators from Murmanskneftegaz, Ltd. destroyed some 5 hectares of surface soil covered with reindeer moss while preparing a plot of land for drilling derricks. This was complicated by the fact that the oil workers were proceeding in their operations illegallywith neither engineering design blueprints nor the results of a state environmental impact study. The Rybachy Peninsula is one of continental Russias farthest northerly points. Rybachy actually consists of two peninsulasthe Middle-peninsula and the Rybachy Peninsula properwhich are joined by large sections of land as well as narrow isthmuses. At the end of the 19th century, eccentric Russian thinker and cosmologist Nikolai Fyodorovteacher of the no less eccentric thinker, tinkerker and cosmologist Konstantin Tsiolkovskyproposed that Russias capital, then St. Petersburg, be relocated to the far north of the Rybachy region becuase its gulf and bays don’t freeze in the winter as a result of the Atlantic Gulfstream. Prior to 1917, Finalnd was a part of Russia. 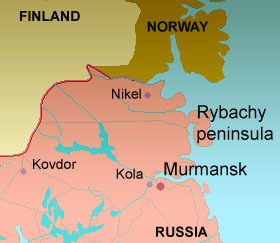 The western parts of the Rybachy and Middle-Peninsulas were taken from Finland and made part of the USSR after the Soviet-Finnish War of 1940. Traces of hydrocarbon, a tell-tale sign of gas and oil rich fields, were found in the Rybachy region in the 1970s. At that time, the USSRs Ministry of Geology recommended drilling the area, but sufficient geophysical investigations never took place. In 1994, with the support of oil companies, the Sevshelf firm undertook seismic surveys of the area and gave the encouraging results to oil concerns. Apparently, an oil field stretches from the peninsula in the sea to the Rybachinskoye oil field. If all norms are observed, experts have said that, in principle, that drilling and extraction of oil on dry land is much safer than drilling in the sea. Along side this is the fact that the Middle and Rybachy Peninsulas are traditional grazing lands for deer. In 2000, reindeer breeders from the state-owned Rassvet even proposed to the regional administration that the peninsulas be considered specially protected nature reserves. However, the elimination of the Russia-wide Environmental Committee has postponed this issue indefinitely. In 2002, Nikolai Kulikov a the co-owner of the Murmansk Shipping Company, or MSC, who was also the former general director of Lukoil-Arctic-Tanker, established a new company Murmanskneftegaz, which, last year, received a licence to work on the peninsula. The company was even registered at, and established its offices in, a building belonging to MSC. Having only just filed out its licenseMUR series license No 11451 NPin March of 2003 to begin its activities and organize its drill profiling work for autumn of this year, Murmanskneftegaz began pilot projects on the Isthmus between the Middle and Rybachy Peninsulas. They began hauling equipment, such as ready-to-construct oil derricks, tractors and other technology onto Middle Peninsula. But the necessary engineering scheme for operations and other necessary documents stipulated for by the license, such as the necessity of carrying out the geologic drilling investigations. were not sufficiently developed. The Pechenga Administration of the Murmansk Region was not informed about the dates Murmanskneftegaz work would begin, blocking their chance to prevent the destruction a part of the local tundra, and raising a host of other conflicts between the company and the administration. Neither were local reindeer breeders consulted in the licensing process. Apparently, the management of this limited liability company did not even glance at the document, said Bellona-Murmansk Director Sergei Zhavoronkin. It was later revealed that the land that Murmanskneftegaz began to churn up with its drilling activities had been on lease since 1991 to the Rangifer reindeer breeding farm, which has some 500 animals. The deer farmers turned to the local land committee as soon as they heard about the expansion of Murmanskneftegazs operations. The reindeer breeders couldnt do anything elsebecause the chaos being wreaked on the land they leased was their responsibility, Zhavoronkin said. In December 2003, the Murmansk Region land committee established that the oilmen had illegally seized the land, levied a fine against Murmanskneftegaz and required it to restore the land within three months. Aside from that, inspectors from the regional Department of Natural Resources established that Murmanskneftegazs activities on the peninsula destroyed four hectares of soil covered with reindeer mossthe main source of food for the northern deer. The inspectors issued an administrative report on the violation, fining the oilmen 40,000 roubles (approximately $1,300). Murmanskneftegaz admitted that it had levelled a section of land with a bulldozer on which it intended to construct an oil derrick, but said that the land had been polluted by third parties. The department of natural resources instructed Murmanskneftegaz in writing to cease its preparatory work and furnish the necessary documents. Alexander Svistunov, Murmanskneftegazs general director, called the events a working situation in a telephone interview with Bellona Web. I wouldnt like to get into details, but for such projects, a mass of agreements are needed, and we didnt receive a range of agreements from the beginning, a number of documents were absent. But bear in mind that ecological interests had still not been affected, he said, referring to the relatively minor harm done to the environment before the oil company had been stopped. Following the deer farmers complaint, Murmanskneftegaz prepared the necessary documents, Svistunov said. At the upcoming April 19th arbitration hearing in the Murmansk Regional court, the regional prosecutor plans to prove the invalidity of the land lease agreement between the Rangifer deer breeders and the administration of the Pechenga region, a finding that would obviously favor Murmanskneftegaaz. The prosecutors protest is based on an appeal to the prosecutor of the Federal Inspector for the Murmansk Region, Vladimir Losev. The prosecution says that the land rented by the deer farmers is federal property, and therefore the land lease between the deer farmers and local authorities is null and void. The prosecution also says the rent for these lands is significantly understated. At present, rent for 90,000 hectares on the Rybachy Peninsula is established at 475 roubles ($16) a year, and 110,000 hectares on Middle Peninsula is an annual 580 roubles ($19). The rental agreement was concluded in 1991. It has been extended a number of times, and the current agreement is valid until 2008, said Rangifer deer farmers representative Sergei Volkotrub in a telephone interview with Bellona Web. It is to be hoped that the regional governor, who is personally overseeing the the oil projects, will appraise these seemingly insignificant facts: Murmanskneftegazs violations of Russian federal law on the territory of the region, and the subsequent haranguing of the land-renting complainants. After all, it is no secret that all big troubles begin with unnoticeable violations. We have been convinced of this time and again. Analysis: Is Russia prepared for oil drilling on the continental shelf?